Cape Henry Collegiate School — Virginia Beach, VA.
Our exclusive Matrix® Aerial will bring superior quality and playability to your field hockey turf installation. Hellas’ exclusive field hockey synthetic grass is composed of curled monofilament fibers and a short pile height, providing excellent foot traction, lower ball friction, and increased ball speed that is ideal for pushes and scooping. 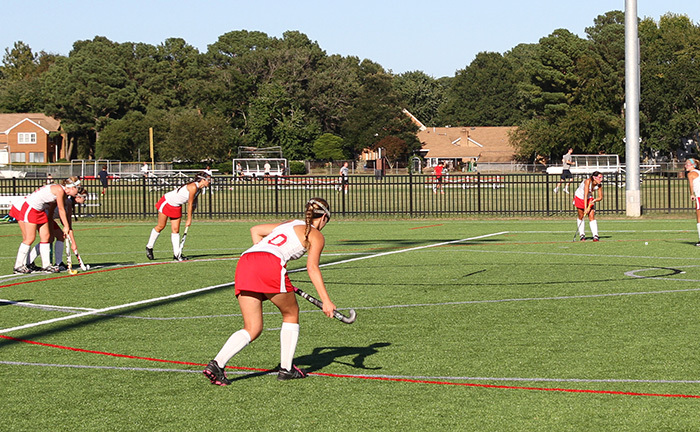 Field hockey is the only sport that mandates artificial turf at every major level of competition, and Matrix Aerial has been carefully developed to ensure the surface installation achieves the specifications and offers the characteristics essential for field hockey athletes. These include shock absorption, surface rebound, considerable friction, and strength. Matrix Aerial field hockey turf allows for a fast, consistent game by allowing optimum runner response and cleat control for field hockey players to reach maximum performance. 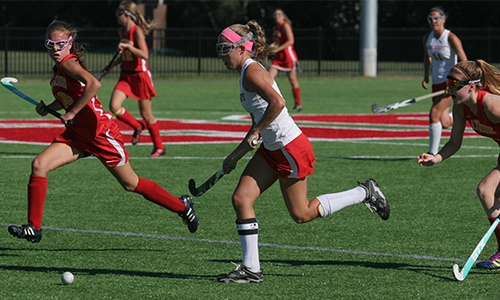 Field hockey also requires a durable, flat surface that remains consistent over use and time. Matrix Aerial synthetic turf fibers are developed to reduce wear-and-tear through research and technology. Additionally, different system specifications, including various infill options, are available to make sure every pitch is customized to the client’s needs. Matrix Aerial can be manufactured in various colors to help schools at all levels of competition make a statement to visiting teams. Product colors for pitch and line markings are also developed to create a high contrast between the ball and turf, ensuring that the athletes’ visions and the fast speed of the game remain unaffected at all times. 12710 Research Blvd. Suite # 240 Austin, TX 78759.